Like Puccini’s Tosca, Heggie’s Great Scott is an opera about an opera singer, in this case Arden Scott. 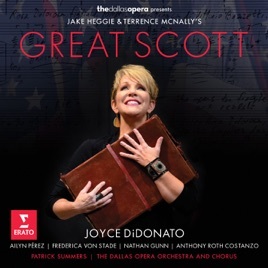 The role was written for Joyce DiDonato, and she sings to great effect in a recording made at the 2015 premiere run. It certainly packs a lot in: in addition to being about the rehearsals for a resuscitated opera, Rosa Dolorosa, Figlia di Pompei, Great Scott also features the Super Bowl as a looming presence. Total commitment and some terrific individual performances by Frederica von Stade, Ailyn Pérez, and Anthony Roth Costanzo make this well worth hearing.